COSTA MESA, Calif. (AP) — Corey Liuget is still trying to get past the worst part of his NFL career. 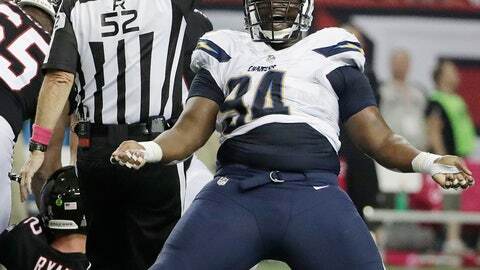 The Los Angeles Chargers defensive tackle returned to the team Monday after serving a four-game suspension for violating the NFL’s policy on performance-enhancing substances. Even though Liuget has served his suspension, he said he still hasn’t put it behind him. Liuget took full responsibility for the suspension when it was announced in March, but he has sued his former personal trainer Ian Danney. Liuget claims in the lawsuit that it was Danney who injected him with a substance that Liuget thought was an over-the-counter anti-inflammatory medication. Instead, he tested positive because the substance is banned by the FDA and NFL. The lawsuit was filed in Los Angeles on Sept. 18. Peter Ginsberg, who is representing Liuget, said nothing imminent is developing with the case. Messages and emails left with Danney’s office in Arizona were not returned. An attorney for Danney is not listed on the district court case docket. Liuget went to San Jose to work out during his suspension. He said he did an hour of on-field work daily, concentrating on getting quicker out of his stance off the line, hand placement and honing his pass-rushing skills. Liuget’s return could not come at a more opportune time for the Chargers (2-2), whose pass rush has struggled. Defensive end Joey Bosa has not played the first four games due to a foot injury, which has allowed teams to double-team Melvin Ingram. The Chargers go into Sunday’s game against Oakland with eight sacks, which is tied for 22nd in the league. They had 12 after the first four games last season. They are also 26th in quarterback hurries (19) and tied for 22nd in quarterback pressures (41), according to SportRadar. Coach Anthony Lynn said he expects Liuget to immediately return to the lineup as long as he is in playing shape. Liuget said he is happy to be returning to a team that is at .500 at the quarter mark of the season. The Chargers lost their first four games last season before winning nine of their final 12 and missing the playoffs by one game. They have not been at .500 or better after four games since 2015. “Knowing that one game cost us last year, it is good knowing that we already have two in the books. We can’t put our faith in someone else’s hands,” he said.